Dimensions 14W x 16.5H in. Perfect for school, workouts or walking about town, these polyester custom promotional drawstring backpacks are slung over the back and out of your way. 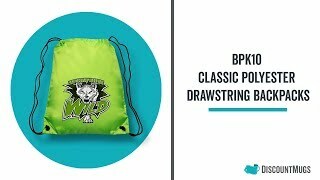 With adjustable 24 inch drawstring straps, these logo drawstring bags are ideal for peoples of all ages. Custom print with your company's logo and name and promote your business with ease. These wholesale promotional bags are popular in industries across the plane. Your already established and prospect clients are certain to be thankful for the thoughtful gift, thus simultaneously expanding your market reach. To order our promotional backpacks with your business logo or design, simply download its template and place your artwork within the imprint area of the design. Upload to our site or select from our gallery of clipart and fonts. You may also select any color combination of your choice for the imprint fonts. Many of our customers order these affordable drawstring backpacks blank. Order today and receive free shipping on qualified orders. Thank you for great service and products with fast delivery. Excellent value on this product. Quick delivery as well. I will order again.